Send me an e-mail if you think that's it's a nifty feature for BeNeoPocott." He also mention that the current BeOS installer files are only for BeOS R5 for Intel devices (not PowerPC). Mic... worked on new optimizations for the NeoPocott gfx engine. We need to check if there are some noticable speed improvements but he did some nice work again ! The new speed test will be posted here soon... Stay tuned ! Not really related to NeoPocott but Anarko managed to build a first version of Boycott using the same portable architecture than NeoPocott ! After hours of work, he succeeded in using the same code conventions. That would certainly help a lot to make easy Boycott ports... What is more, that means that a first version of Multicott (including Neogeo Pocket & Gameboy support) could be possible soon. Stay tuned for more news and maybe releases soon !!! Please visit the Official Boycott Site. The fake images reported yesterday were removed from their respective sites and the people behind this unofficial and not very respectful stuff send apologies to Brian Peek. NeoPocott DreamCast is a free and legal port of NeoPocott. Please never distribute it or sell it with roms ! Please visit the Official NeoPocott DreamCast site. 12 / 28 / 2000 NeoPocott 0.38b PocketPC is OUT !!! - Compatibility Improved (0.39b1) : Better colors in intros for some games (Cool Boarders, Cool Cool Jam) ! NeoPocott DreamCast (DC) Updates & COMPLAINT !!! Brian Peek has updated his download page for NeoPocott with a new Cdrwin image (CUE/BIN format). He also updated the Individual Files distribution with a valid IP.BIN file in order to make easier self-boot CDs. "We're starting to notice a very disturbing trend: Others are taking NeoPocott and making their own releases of it in other formats with NEW FILES INCLUDED and OUR FILES REMOVED. Before you make ANY re-release of this software, please contact us. We might currently be working on that format, or not want it to be re-released in that fashion. Please, people, have some respect for other people's work." NeoPocott for PS2 news ! Back from vacation, Simon Singh is progressing nicely with its PS2 port of NeoPocott. Commercial games are now playable and he is working in sync with the latest 0.38 source core. Expect some more news and maybe screenshots soon ! More news about its progresses soon ! NeoPocott 0.38b PocketPC Ipaq build just released !!! Mic... has just released a first version (not a preview this time) of NeoPocott for PocketPC. The binary is for Ipaq only but other builds are forthcoming. This version is in sync with the latest common 0.38b release of the emulator so you can expect a better compatibility, a better speed. What is more, Mic... added controller skin ala PocketNES. Official Unofficial NeoPocott 0.38 in Spanish !!! OBYS has just released a spanish version of NeoPocott Win32 0.38 release. Download Official Unofficial NeoPocott 0.38 Spanish Version. 12 / 27 / 2000 NeoPocottDC is OUT !!! Complete redesign of the screenshots page ! I have completely changed the design for the screenshots page and I also updated it with screenshots from latest release for PocketPC & DreamCast ports. BeOS screenshots are forthcoming ! Please visit our Screenshots page. Complete redesign of the download page ! I have completely changed the design for the download page so it is easier now to download the necessary files for the port you want. Documentations, technical docs and compatibility list were also sorted. Please visit our Download page. THE VERY AWAITED NEOPOCOTT DREAMCAST IS HERE !!! Brian has finally released his DreamCast port of NeoPocott again to celebrate my birthday. I added a great spanish site about SNK consoles on the affiliates list. Please visit Spanish SNK Central. Mic... could not release a 0.38b version for PocketPC for yesterday but it is on the way... The UI will be soon ready, speed gets better and better and the thing itself is becoming very great ! Two requests for BeOS users and Win32 users ! I received two mails about the new files uploaded for the NeoPocott 0.38b version. I want to know if things are true or not... Has anyone encountered some problems with the BeOS installers ? Is it confirmed that there could have a virus in the Win32 file ? Voodoo's Compatibility List just updated !!! Please visit our Official NeoPocott Compatibility List. Emuholic Compatibility List just updated !!! Guyfawkes has just updated his Neogeo Pocket Emulators Compatibility List taking in account the compatibility improvements in 0.38b release. Here are his own words : "It's not a full update as I was hoping to do because of time restriants, only non-working and partially working games have been retested. When I get some more time in the new year I will be able to fully retest all the games". Please visit Emuholic Compatibility List. Official Unofficial NeoPocott 0.38 in Italian !!! _JC_ of EmuIta has just updated his italian version of NeoPocott in sync with the latest 0.38 release ! You can download it here or visit the official site here. Enjoy ! Download Official Unofficial NeoPocott 0.38 Italian Version. 12 / 26 / 2000 D-Day !!! To celebrate my Birthday, NeoPocott 0.38b was just released for many ports ! NeoPocott 0.38b Win32 was just released by Gollum !!! You can download NeoPocott 0.38b Win32 here. Enjoy ! NeoPocott 0.38b Acorn Risc OS was just released by David McEwen !!! You can download NeoPocott 0.38b Acorn Risc OS here or visit David McEwen pages here. Enjoy ! NeoPocott 0.38b MsDos was just released by Anarko !!! - 0.38b release, happy birthday Gollum! You can download NeoPocott 0.38b MsDos here. Enjoy ! NeoPocott 0.38b BeOS was just released by Niels Wagenaar !!! You can download NeoPocott 0.38b BeOS here. Enjoy ! NeoPocott 0.38b Macintosh was just released by Richard Bannister !!! You can download NeoPocott 0.38b Macintosh here. Enjoy ! NeoPocott 0.38b DreamCast to be out tonight !!! Upcoming changes to this web site ! I will certainly update soon the site with a new download page with better design and download facility and also, I will add DreamCast and BeOS screenshots sections ! All the NeoPocott development team and myself wish you a Merry Christmas !!! - Compatibility Improved (0.38b4) : Better sprites display in games (Sonic, Metal Slug) ! Thanks to Mic... optimizations (we are still testing and validating his new code) in the gfx engine, NeoPocott runs now at full speed on PocketPC and DreamCast ! Nils Wagenaar has posted some screenshots of his forthcoming BeOS port ! He is still working on speed issues, keyboard support and left bugs to fix but a release could be out soon. What I can say is J-8 !!! NeoPocott for PocketPC preview released !!! Mic... has just released a preview of his PocketPC port of NeoPocott. This preview is only for Ipaq users. It is only a preview version so expect a better release soon (with Keypad ala PocketNES). You can download it HERE or check the dedicated web site HERE. NeoPocott for BeOS news !!! Niels Wagenaar made some nice progresses with the BeOS port. He planned to use the SDL library for better portability and he successfully managed to compile and run the whole stuff (no display yet). I guess screenshots are forthcoming ! Brian Peek has posted new screenshots on his web site of the DreamCast port. Please visit Ganksoft Entertainment for bigger images. All stuff should be ready soon, he is still working on speed issues though. What I can say is J-10. Here is a logo made by Champipi for this other forthcoming project, just to wet your appetite ! NeoPocott for PocketPC web site online !!! Mic... has just put online his dedicated web site to NeoPocott for PocketPC (NeoPocottPC). You can check it out HERE. I also added his site to the links. Niels Wagenaar has joined the BeOS team to help to make a first release of NeoPocott for BeOS. Stay tuned ! NoFX has just released an italian translation of the technical documentation of Neogeo Pocket 1.1. Please go to the Download page ! NeoPocott for DreamCast (NeoPocottDC) news !!! Brian Peek has updated his news page for his DreamCast port. The program is now in beta testing stage before its Xmas release. What is more, Brian is finishing the Credits page and claims that about 99% of the hard work is now done for NeoPocottDC. Since we have no news from our BeOS team since a very very long time, I decided to hire someone else to make a valuable NeoPocott BeOS port. Not only, this guy will work on a BeOS port (expect a first release for january) but it will also certainly work on a GTk linux port and also a KDE linux port !!! Whoa ! That sounds interesting for you linux users ! At the end, I managed to get rid of all this nasty display in the Win32/official port ! In order to reply to many questions I often received in my mail box, I put a small disclaimer above. Here is a logo made by Champipi for this forthcoming project, just to wet your appetite ! Due to a total hardware crash of his Amiga, Colin Ward was enable to release today his first version of NeoPocott WarpUp. We all hope that he will manage to recover the sources and compile/release a version in the next few days !!! Colin Ward changed the NeoPocottPPC name into NeoPocott WarpUp. Because it could be confusing for some people (there are two OS on Amiga PPC, a PowerUp and a WarpUp and PPC usually refers to PowerUp). What is more, Multicott, our future multiple handheld emulator was changed to MultiPocott because the name indicate more clearly the purpose of the emulator. Well, these days, the NeoPocott development team is quite busy with optimization stuff. Brian Peek, Voodoo, Colin Ward and I are currently working to optimize the common portable code so as all ports can get a huge speed increase. In the same way, Brian is focusing on specific DreamCast optimizations. Thanks to every people who notice that but all screenshots pictures were messed up, I have just fixed this. I also change the DreamCast screenshots link. Enjoy ! A new gfx designer for *Cott stuff ! Welcome to CHAMPIPI our new gfx designer. He already made cool icons for NeoPocott, BoycottAdvance & Multicott. Stay tuned for some nice logos and other stuff from his side. NeoPocott for PocketPC (NeoPocottPC) news ! Mic... will soon release a first beta. In the same time, he will put online his dedicated web site ! Stay tuned. NeoPocott DreamCast (NeoPocottDC) news ! Brian Peek is still working on the GUI and is adding some nice features to the emulator. He is also working hard on the speed side to get full speed achievement on the DreamCast ! - Compatibility Improved (0.38b4) : Intros are now perfect for many games (Crush Roller for example) ! - Compatibility Improved (0.38b4) : Magical Drop Pocket intro is now perfect ! Colin Ward is working hard on adding support for 3D graphics cards, so that games can be stretched and filtered by hardware. A release will be very soon ready ! Please visit his web site where you'll find soon NeoPocottPPC ! Stay tuned ! Mic... succeeded in using the GAPI instead of the win32 API and add keyboard support. I dunno yet if the port is faster but he managed to get a fullscreen mode with GAPI ! Maybe soon a keypad like PocketNES ;-) Stay tuned ! New screenshot for NeoPocott DreamCast ! Brian Peek posted a new screenshot of the selecting screen for NeoPocott DC. He also made some speed improvements for his port and he is working on a FPS counter. Well, we could expect a release before Xmas... Stay tuned ! It is a new port, it is not the DreamCast port...Still no idea ? RUMORS : new ports for NeoPocott ? But, for the early owners of a recent console, we might have a surprise for you... Stay tuned ! (Q) I've got a HPCPRO/ARM, will NeoPocottPC work on it ? (Q) I've got a CASSIOPEA, will NeoPocottPC work on it ? (R) NeoPocottPC will be compiled for ARM, MIPS and SH3. (Q) Where did you find this WinCE emulator, I want it ! (R) The emulator is part of the free Microsoft devkit www.pocketpc.com. According to Richard Bannister, I changed the link for NeoPocott/MacOS so people could visit his whole software page. The new layout (without copyrighted SNK logos) is ready and I can tell you that it's nice. Screenshots soon ! The translation team at www.emuita.it has just released their unofficial version of NeoPocott 0.37b in Italian ! Here is the file. Photo showing an Ipaq running NeoPocott for PocketPC !!! Mic... used a webcam with a poor quality so the picture is quite ugly but that's enough to get an idea of the thing running on the Ipaq... Great ! These pictures were taken by Mic... using NeoPocott for PocketPC on the PocketPC emulator. He also tested successfully the thing on his own Ipaq ! 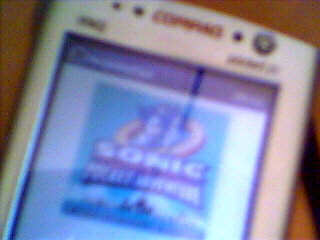 He will send us photos of his Ipaq running Sonic tomorrow... Stay tuned ! Juan M. Caravaca Botia has just released a spanish translation of the general documentation of NeoPocott 0.37b. Please go to the Download page ! Unofficial NeoPocott 0.37b in Italian ! People at www.emuita.it informed me about an italian version of NeoPocott 0.37b. Come back here soon to download this official unofficial version. Compatibility improvements in 0.38b4 !!! 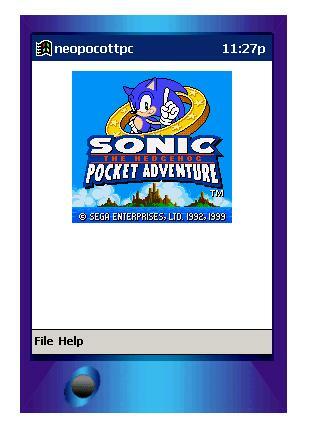 Thanks to Judge, I added two hacks to get Sonic Pocket Adventure & Metal Slug 2nd Mission fully playable !!! I will post the screenshots later... Stay tuned ! Add a link to our new MessageBoard !!! If you wanna discuss about Emu5ever, Boycott, NeoPocott, BoycottAdvance, Multicott, please use our message board. Emulation programming, news/rumors topics are also welcomed. My nickname is Neopocott... If you encounter some problems to use our emulators or want to make a feature request, do not hesitate to leave a message. HUGE SPEED improvements for NeoPocott Win32 port !!! Thanks to Mic... (see below), my Win32 port is now about 350% faster than before which means that zoom x2, x3, x4 and even full screen are now playable !!! He rewrote all the bitmap blit stuff and the result is dramatically better ! I will apply his changes to WinBoycott too so expect new releases soon of these ports. Mic...(the no-more-anonymous Pocket PC guy which is a great friend of mine) has made some progresses. 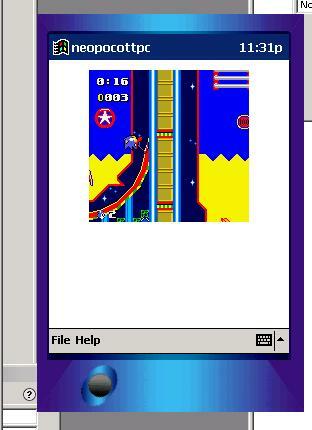 All things just compile but crash on the PocketPC emulator. He decided to rewrite all the WindowsCE code from scratch using MFC. Mic... will send us screenshots when something at least work. Stay tuned !